Southern Cross Divers use and throughly recommends this analyser, it is by far the best on the market today. We use them day in and day out in our store and totally punish them, they have never missed a beat. "No Helium sensor to replace - ever!" This analyser is intended primarily for use in checking the correct mixing of nitrox (air enriched with oxygen) and trimix (a mixture of air, helium and oxygen). After connecting the analyzer to a bottle with a breathing mixture, the content of oxygen and helium is shown as percentages directly on the display. This trimx analyser reports "FOUL AIR" if the oxygen, nitrogen and helium can not be calculated due to contamination which is a major safety advantage over any other analyser. It has internal firmware which can be user upgraded to add functionality. Never be out of date again! The same type of standard electrochemical sensor (R17D) normally used in analysers for diving is used to determine the oxygen content. The helium content is determined on the basis of measuring the speed of sound in the analysed mixture. The speed of sound depends on the content of helium and oxygen, and on the temperature of the mixture. The dependence of the speed of sound on pressure is marginal and can be ignored under normal atmospheric pressure. At 0°C the speed of sound is approximately 970 m/s in pure helium, 330 m/s in air, and 315 m/s in pure oxygen. Raising the temperature by one degree raises the speed of sound by approximately 0.175%. The speed of sound in the mixture is described as a non-linear equation of temperature, oxygen content and helium content. The speed of sound is measured directly as the time it takes for an acoustic impulse to travel between two microphones. This measurement is taken alternately in both directions so that it will be possible to eliminate the influence of the gas flow-rate. 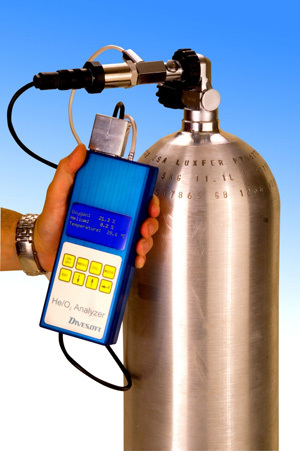 Every analyser produced is tested in the complete range of acceptable oxygen and helium values. In addition to the testing of air, pure oxygen and pure helium undergo testing with 12 different calibration mixtures. Calibration mixtures are gravimetrically mixed from pure basic gases and are exact to within two decimal places. In addition to exactness, the accuracy of compensation for the influence of the flow-rate of the analysed gas is also tested. Hi-tech analyzer for measuring nitrox and trimix gases. After inserting the analyzer adapter (included) to a bottle valve with a breathing mixture, the content of both oxygen and helium is shown as percentages directly on the display at the same time. - Voltmeter plug-in - to check batteries (lights, scooters...). - Simple flow limiter for all valves. - Hard and watertight StormCase. Pressure sensor - the analyzer can measure pressure in the tank and gas mixture at the same time. Download is performed using the FLIP program from theAtmel Corporation. You can obtain this program via this direct link FLIP 2.4.0. for Windows. If you are unable to dowload the program directly, you will find the newest version of FLIP on the firm's website at Atmel. Use of the FLIP program is described in the download manual. The professional flow limiter with connection to the DIN - G 5/8" for 200 and 300 bars, with quick release valve. The connection hose included.